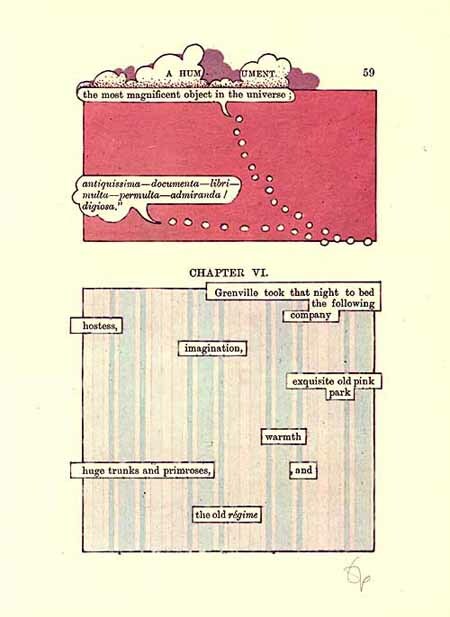 Humument is Tom Phillips treated version of the Victorian novel ”A Human Document” by W.H. Mallock. Phillips transforms the text by drawing and painting over it and revealing just selected words. You can view the converted text online or in book form (Amazon). In the mid-1960s, inspired by William Burroughs’s “cut-up” writing technique, Tom Phillips bought an obscure Victorian novel for three pence — W. H. Mallock’s 1892 novel, A Human Document. He began cutting and pasting the extant text, treating the pages with gouache and ink, isolating the words that interested him while scoring out unwanted words or painting over them. 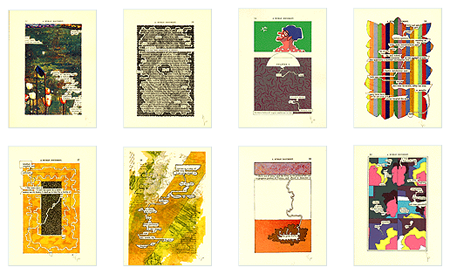 The result was A Humument, and the first version appeared in 1970. Matt Linderman wrote this on Feb 09 2007 There are 8 comments. That’s my new favorite poem. Awesome. Crispin Glover employs similar techniques in his books which he also presents as slide shows. I got to witness one of these events at the height of my early fascination with Dada, Surrealism, Futurism, etc. Very fun. You know, derivative works’ legalities are based on the percentage of the original work that is represented in the derivative, if the work is still covered by copyright…which in this case, it is not. And, besides, this is a nice re-visualization of the work. I love this work… named my college band after it (the original Human Document name not Humument). 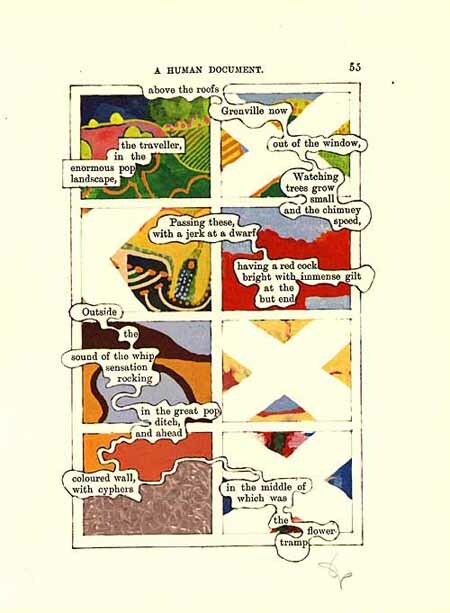 Incidentally, a Humument was also early to the web, with the first version of A Humument Homepage launching in 1996. I was lucky enough to work on it. Now it’s in the hands of the very talented John Nick Pull, who also keeps http://tomphillips.co.uk/. Phillips work is very deep and very broad. There’s a lot to discover there. I’d nearly forgotten about this stuff, but the post very timely. While reconsidering the practice of newsgathering for 21C media, I started looking at the way words fall on screens. This led to a form of prose that looked like poetry, and forced both economy and clarity at once. The farther I push this concept, the more I appreciate classic typography and caligraphy and even comics! Was the written word beggared and held hostage by machines in the industrial age? Whitman, e.e. cummings, Moholy-Nagy, each explored this terrain. Is it time to look closer, to consider the potential of type to speak more richly?